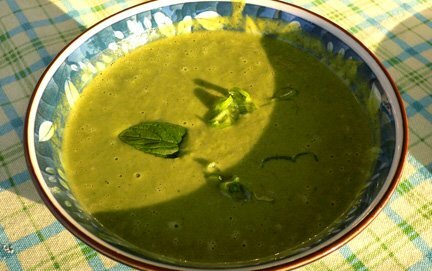 It's much too hot to cook for hours let alone eat hot food, so this quick-to-make soup is in order since it's chilled and minty! Serves 4 as a starter or light lunch. Great with scones or bruschetta on the side, or perhaps kabobs for a dinner on the deck. Mix peas, onions, lettuce, mint leaves, salt, pepper and the broth in a pot. Heat to boiling; reduce heat and cover. Simmer until vegetables are tender, about 20 minutes. In batches, puree the soup in a blender until velvety smooth. Return to the pot and stir in the yogurt, butter and chives or onion. Serve hot garnished with a mint leaf and some sprinkled chives, or serve chilled with the same garnishes after refrigerating for up to 24 hours. This is an excellent tri-doshic meal that is good for everyone. If you're watching your weight, reduce butter or ghee and yogurt to half the amounts. not sure why the recipe says carrots and such, when those items are not listed in the ingredients list. I've removed the carrots since they aren't supposed to be there, thanks for letting me know.